IEEE Puerto Rico Disaster Response Fund - IEEE Foundation, Inc.
Hurricane Maria wreaked havoc on Puerto Rico disrupting basic services and plunging the island into darkness. More than a month later – very little has changed. 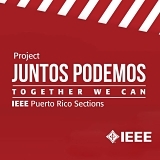 IEEE members living in Puerto Rico are taking steps to aid the most severely stricken areas of the island. Your donations to the IEEE Puerto Rico Disaster Response Fund will make their plans a reality and bring light and communications to those living without. You will receive a confirmation email which contains confirmation of your donation. Your donation ensures that IEEE is able to address immediate needs through the distribution of solar lanterns for family and individual use, and then deploying medium-term solutions for light and communications in rural communities. Full details on phase 1 and phase 2 of the plan can be found here.